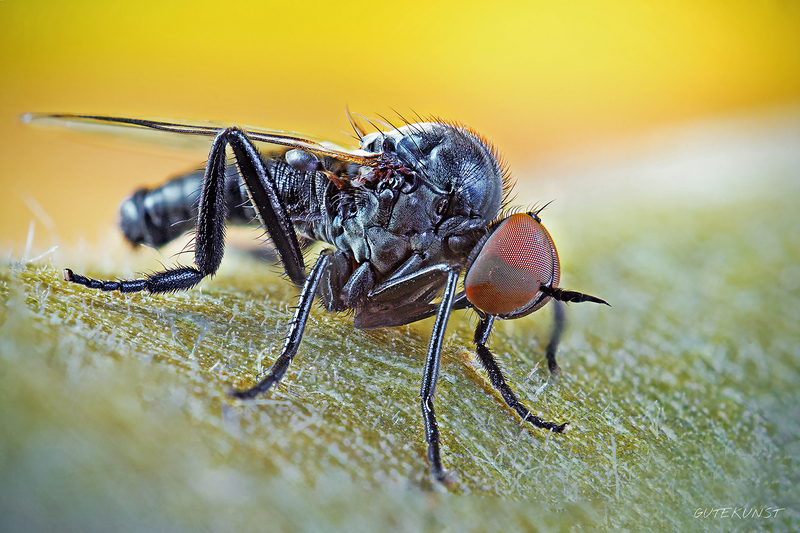 As an example, you can imagine a fly on whose eyes you set the focus of your camera. The eyes are sharp on the photo, the abdomen disappears in blurriness. Now you focus on the abdomen and take a photo. Now the eyes are blurred, but the abdomen is sharp. These two photos will now be combined to a picture on the eyes and abdomen are sharp! Ready! 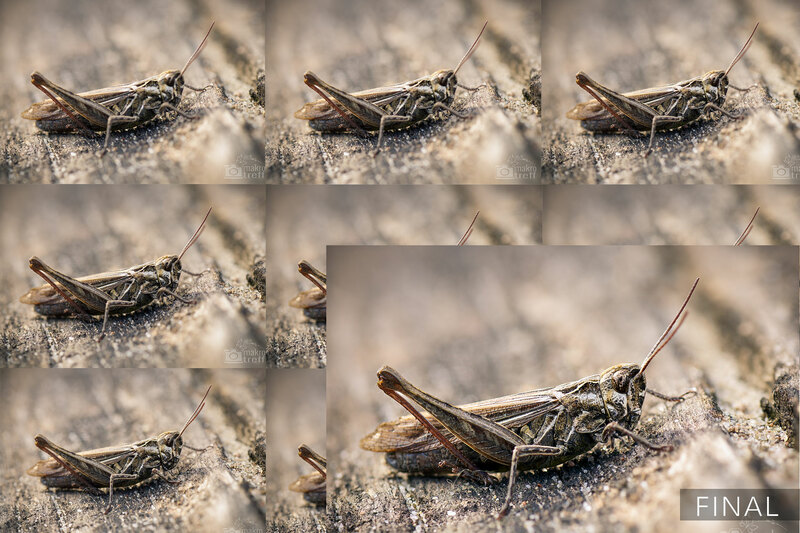 Example of a stack: From 9 individual photos, a photo with consistent sharpness is created. Now you're probably asking yourself the question: Why not just fade out without an end, then the sharpness range will get bigger? 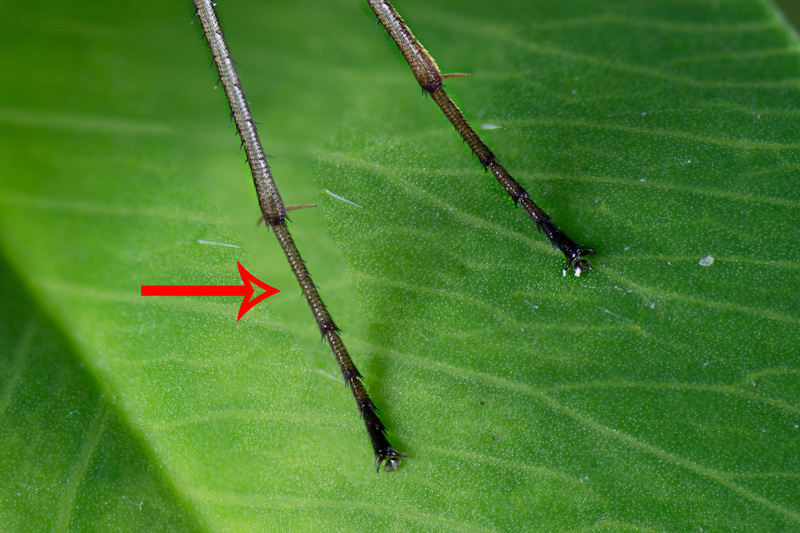 The thought is not wrong, but in macro photography, especially with high image scales, the diffraction blur comes into play when the aperture becomes smaller. The photo will no longer be sharper, but blurred after a certain aperture. You don't necessarily need expensive equipment such as a tripod or a macro sled for the Focus Stacking. These can be advantageous for static motifs such as plants etc., but at least with not too high reproduction scales you can achieve great results even without these aids! This method allows you to slowly rotate the focus ring to change the position of the focus plane on the subject while taking photos. That means to stay with the fly as an example, you focus the fly's eyes, take a photo, turn a bit further and take another picture, etc. At the end of the process, the individual images are joined together by means of software. Animation of the different focus planes. The focus was first set on the front foot, a photo was taken and a bit further back focused and a photo was taken again. This is repeated until you have photographed all the parts of the subject that you want to focus on later. 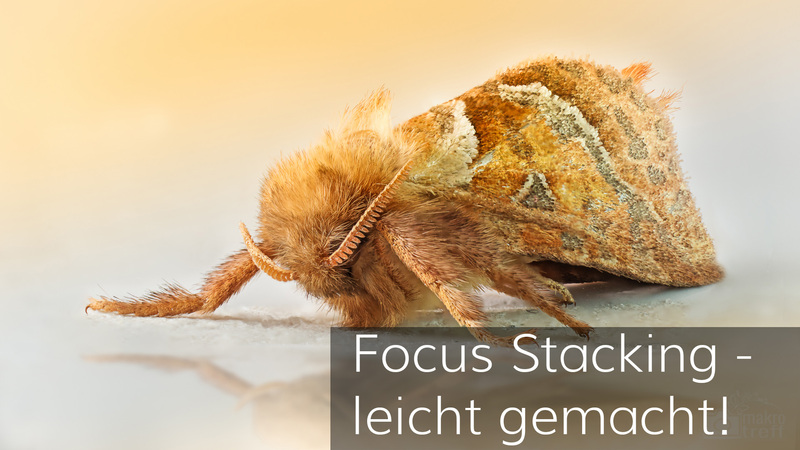 There is now a wide range of software that can be used for focus stacking. It is not easy to make a recommendation. In any case, there are Adobe Photoshop, Helicon Focus, Zerene Stacker and Combine ZP (Freeware). All programs deliver good results! I recommend to have a look at the corresponding test versions and then decide which software is best for you. When stacking without tripod and macro slide, small camera shake and shifts cannot be avoided. This can lead to errors, so called "halos", when calculating the individual photos by the software. These are bright blurred veils or outlines that appear especially at the transitions of the various levels of sharpness or fine structures such as hair. To avoid halos, you should make sure that the transitions between the individual photos are as smooth as possible and that you always let the individual levels of sharpness overlap a little bit. Furthermore, the subject should not move during the shooting of the stack row if possible (attention wind!). Another important point is a constant exposure of the individual photos. However, you can still adjust the settings in postprocessing. Less is more! The more photos you take per stack row, the more likely you are to make mistakes when assembling. Often it is sufficient to take only 2-3 photos, especially for larger subjects. My stack photos usually consist of about 10-20 single images. To make it easier to have it in the post-processing it is recommended to take a black photo before and after a stack row (hand in front of the lens) so that you always know where your stack row stops!